The History Channel delves into the colonial past of America with a three-part miniseries, Sons of Liberty, which debits tonight. The series explores the manner in which the Founding Fathers were drawn together and what life was like under British colonial rule. This is the type of series that you would have wanted to watch in history class because it vividly brings to life the era and gives faces and personalities to these historic figures. There are several familiar faces, including Ryan Eggold (The Blacklist) as Joseph Warren, Henry Thomas as John Adams, and Jason O’Mara (Complications) as George Washington, among others. 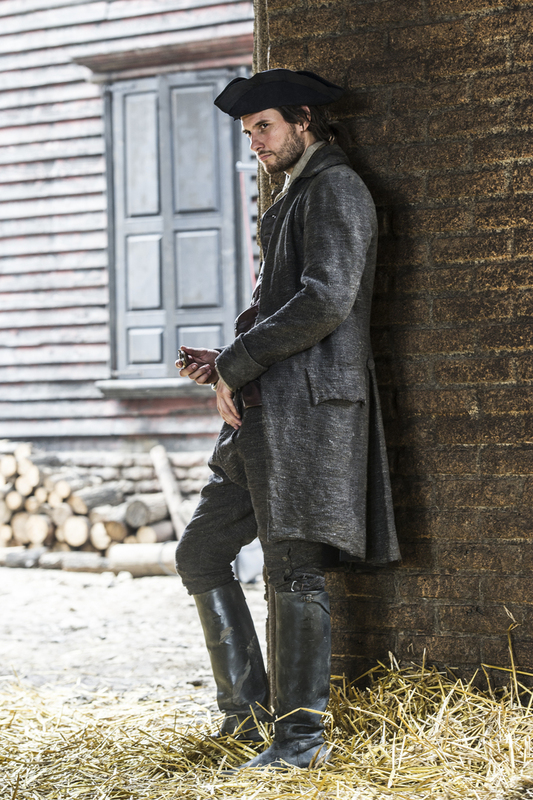 Ben Barnes (Seventh Son) portrays Sam Adams, an almost Robin Hood like individual who draws the Crown’s ire when he fails to collect from the impoverished people of Boston. OHSOGRAY participated in a call with Barnes in which he discussed his role and the challenges of bringing history to life. 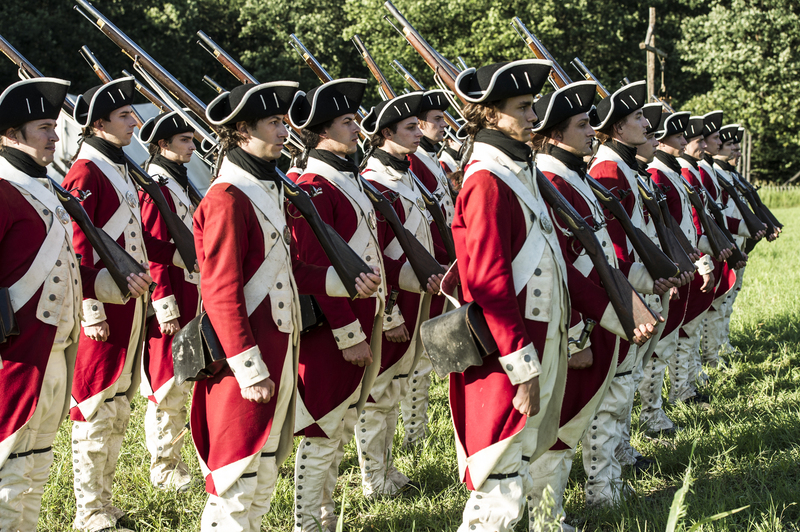 Sons of Liberty, a three-night event, debuts tonight at 9/8c on History. What was it about Sons of Liberty that made you want to be involved? Ben Barnes: Well, I think I didn’t really know –I wasn’t really that aware of this particular era of history. I knew somewhat about […] John Adams from the HBO series, but I didn’t know anything really about Sam Adams and I didn’t realize that all of these figures, all of these famous characters had all been part of the same fight, and the same era, and the same kind of revolution. So I sat down and read all three episodes— it took me about 5 hours or something and some tea—[…] With Sam Adams kind of being the protagonist and taking this journey from a guy that we meet at the beginning, drowning his sorrows in a pint glass, but kind this Robin Hood-esque figure who’s defaulting on taxes on behalf of the community. Then six hours later we see him at the Philadelphia Congress giving a speech about the nature of freedom and all these kind of very hardy themes. So I thought what a great kind of transition. It wasn’t a man that I knew very much about. Obviously, I could do some research on him. I kind of had a little bit of liberty to present him how I imagined him in the reading of this very exciting story about this integral time in the founding of the country. Then I spoke with the director and she was very keen that it was a very kind of warts and all, […] unlooked at,at this period, which put me on board because I think we’ve seen a lot of adaptations. There’s been a lot of story telling around this era…about the War of Independence, but never in such an action-packed, fun way as this. How was it to film the mini-series in Romania? Ben Barnes: It’s obviously very difficult to film in modern day Boston, 1765 Boston, by virtue of the fact that nothing looks the same. You need a bit of a blank canvas, and I think Romania very good—great crews and set builders. When I arrived in Romania, there were wooden structures that looked like wooden scaffolding, and I thought, “This is never, by the time we need to film on this Boston square set in 6 weeks, this is never going to be ready.” Then we went and shot on some locations, we actually shot in the fields where Vlad the Impaler killed his victims and Bucharest— we shot some of the war scenes there— by the time we got back to the studio on the backlot, we had these 360 degree sets. You could walk down alleyways, you could walk into a stable with horses in it, or turn around and see a ship actually floating in water. They really did it all. I think it was just a question of money and great set builders; that the reason they decided to shoot there with a bit of a blank canvas, I think. Can you talk a little more about the research you did and what drew you to the character? Ben Barnes: There were things that I discovered about him in reading biographies. The timelines are sometimes slightly stretched or condensed in various ways. All the events happened as factually accurately as The History Channel could make them with what we know. But, the timelines have been sometimes tweaked in order to tell the story in the most exciting way. The tax collector aspect of Sam Adams career was slightly earlier than it seems when you watch it, even though it’s the first thing you see. He was in a big dilemma growing up whether to enter the priesthood or to follow a more political…to follow his heart into politics, essentially. I discovered that he’d lost a wife and several children, and siblings to various diseases. That was something that wasn’t particularly in the script that I wanted to sew in and they let me add in the part about losing his wife.—just for a bit of personal backstory just gently sewn in there, which was fantastic. I wanted to honor the personal story of Sam Adams, as well as what he achieved. It’s very exciting. I listened to some books on tape about the period while we were filming. You get to a scene about one of John Hancock’s ships being seized by the British and think, “Oh we’ve got a scene…we’re going to film that exactly as I imagined it.” […] It’s an exciting thing when you realize you’re filming something…trying to depict something that actually took place. What did you learn about yourself in playing this role? Any surprises? 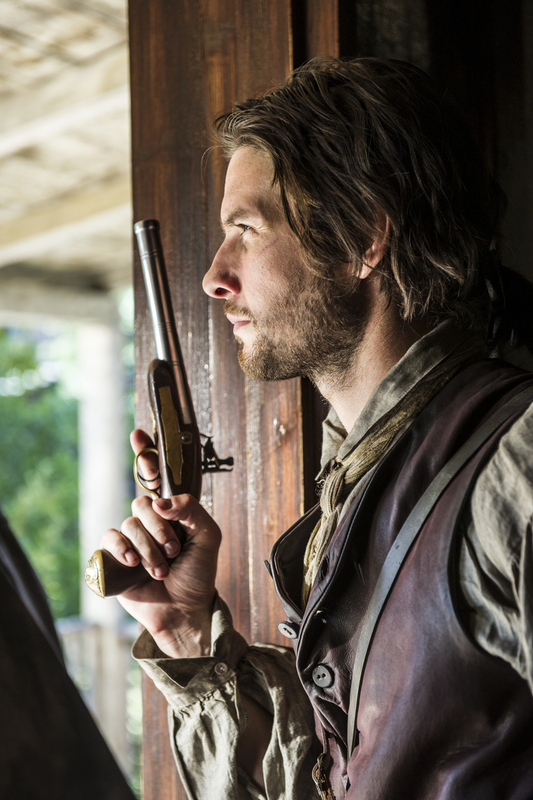 Ben Barnes: Well, I was surprised to learn how very little I knew about this period. I think maybe that comes from being educated in [a] British schooling system that wants to gloss over anything that has to do with the dissolution of the vast British Empire that existed before this. I knew a little bit about George Washington and Benjamin Franklin, but I had no real idea that they’d all been in the same room at the same time, working towards the same things. You see them on dollar bills and you see them on beer bottles and you kind of conjure this image for yourself. I didn’t realize how united this band of famous characters really was. I also found out that the British red coat uniforms fit me perfectly. There’s a scene where we heist the gunpowder silo and we dress up as the British red coats and that was the only costume I didn’t need a fitting for. It was perfectly snug. I enjoyed strutting around that day on set. To the Americans playing the Founding Fathers saying, “I don’t know about you guys, but I think red is my color.” It just fit perfectly. What is it like to be in these costumes in a recreated 1700s America? Ben Barnes: Donna Zakowska, who is our costume designer, has a lot of experience in this era. She was very thoughtful. She helped me choose a signature color for the character. You meet him in the beginning and he’s wearing all these earthy greens and browns. Then he gets his waistcoat as we get to the Boston Tea Party that is this deep burgundy color. He has this kind of action man […] coat which has a burgundy lining in it. But in the end he’s in this three-piece, famous, burgundy red suit that he’s wearing—if you click onto Wikipedia and look at the picture of Sam Adams. It was kind of thought through on that level. Once you put those costumes on…my first thought was complete panic, because it was so hot in Romania when we were shooting and these coats were two inches think and wool. I thought the actions sequences were going to be tough. Actually, then we ended up shooting a lot of the action stuff at night, which made it more bearable. The costumes, I thought, were absolutely stunning to look at. But you’re right [that] they do give you a certain gait when you walk and a certain confidence when you have faith in the costumes. You don’t have to worry about the image that you’re presenting. You can focus on the moments and the emotions of the scene. Do you have a different approach when preparing to play a historical person as opposed to a fictional character? Ben Barnes: I think you have to treat it a little bit as fiction unless it’s somebody obviously that people know—if you’re doing an impression of someone, that’s your job and what people know, then you have to be a bit more careful, there’s more of an impressionistic element to it. But I think with this, I wanted to honor the script and tell the story trying to be told by The History Channel, but also when you see this, little details about the priesthood or losing a wife early on…you want to sew in elements of that where you can. Where it feels seamless and it cannot get in the way of the story but actually add something to the character’s plight and add to the story telling. You feel that sort of duty. I’ve played a couple of characters that are real people—they’re living—that’s kind of a different thing. I haven’t yet had the challenge of playing somebody who people sort of know well, know what they sound like, how they walked…. I think that would be a very different challenge. Something like Eddie Redmayne has just done in The Theory of Everything, which was astounding. I’ve never had a challenge like that. It was a new and exciting challenge for me to pick and choose which parts of the real Sam Adams to try and bring out. If you’d lived during this time period, are these men you could picture yourself hanging around? Any you’d want to have a beer with? 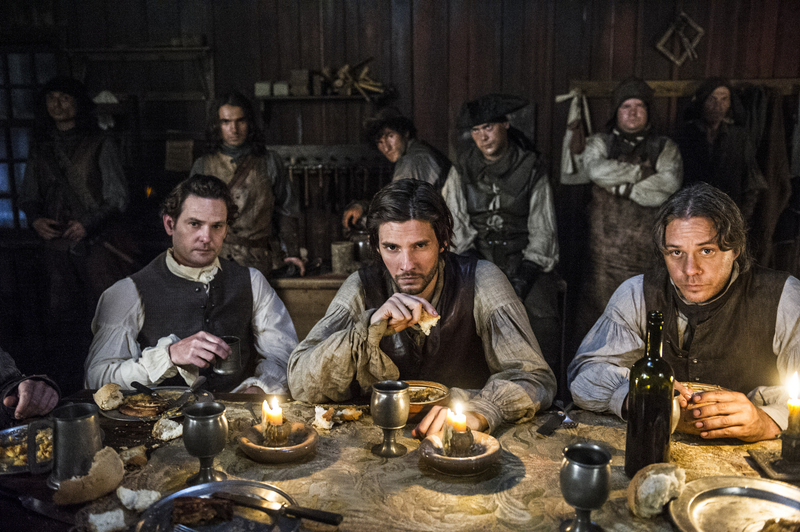 Ben Barnes: I think they are probably guys that I would’ve found quite intimidating. They’re all quite headstrong with very strong and vivid ideas for how they wanted their futures to pan out and the future of their country, and the future of their communities. They all were approaching it [in] different ways. There was a lot of vehement debate about how they would go about achieving what they wanted to achieve even though it was the same goals. I don’t know if I’m bold enough that I could compete with that. The History Channel actually had a quiz on line that you could do where you answer a bunch of multiple-choice questions with pictures. It’s quite a fun quiz. I did the quiz and I ended up as Joseph Warren, even though I was trying to answer the questions as Sam Adams. I wanted to get myself at the end of the quiz, but I didn’t. [It’s] probably because Joseph Warren may be more of a romantic or whatever. I have no idea how I ended up getting that character. But, I think Benjamin Franklin would probably be the most fun one to have the beer with. He was a bit of a scoundrel, so I think he would probably have some good stories.